The Pilgrimage also visited the Passionist Community at Brugnato (Communita dei Passionisti, Via S. Lazzaro, 2, 19020 Brugnato, Italy) to view a painting in their community chapel. The community were most welcoming and asked us to join them for lunch. 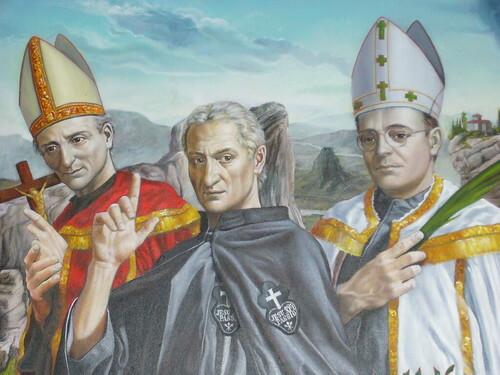 Seen here is a portion of the work we called to see – three Pasionists – Saint Vincent Mary Strambi, C.P., St. Paul of the Cross and Blessed Eugene Bossilkov, C.P. This entry was posted on 24 October, 2007 at 2:40 am and is filed under CP. You can follow any responses to this entry through the RSS 2.0 feed. You can leave a response, or trackback from your own site.